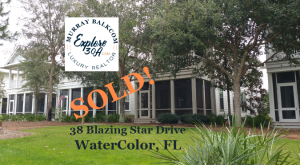 Just Sold 38 Blazing Star Dr! 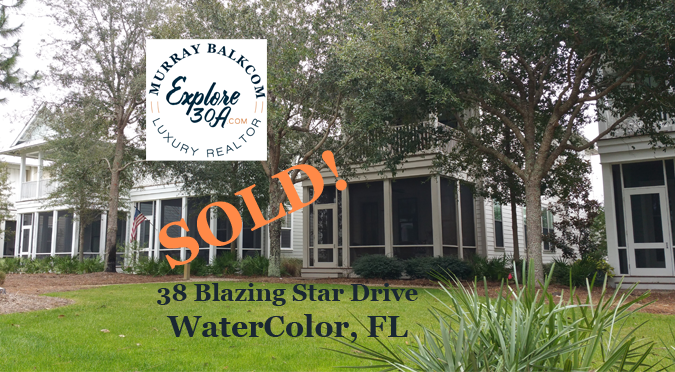 Murray Balkcom, Luxury Realtor | Broker Associated proudly worked with the buyer to closer 38 Blazing Star Dr, located in the 30A beach neighborhood of WaterColor, FL. This 2,307 sq ft, 2-story, 4 bedroom, 5 bathroom home overlooking the park is part of SummerSweet Place at WaterColor. Selling price of the home was $735,000 which comes to $318.60 per square foot. Located on 499 acres, WaterColor is known for its eco-friendly design and environmental stewardship and is a shining example of how responsible development is enhanced by nature. In addition to the award-winning WaterColor Inn, there are plenty of shops and restaurants, nature trails, tennis club, spa and beach club. WaterColor is also known as being located on a rare coastal dune lake, Western Lake, which is the perfect place to try stand up paddling at YOLO Board Adventures located at the WaterColor BoatHouse. ← 26 Beachwalk Ln | Sold! Live South of 30A for Under $160,000!